According to a new video released by the Islamic barbaric group ISIS, which also identifies itself as the Islamic State of Iraq and Syria, a Japanese Christian man who had traveled to Iraq in an attempt to rescue a friend who was captured by the terrorist organization has been beheaded. As previously reported, Kenji Goto, 47, who became a Christian in 1997, told reporters last year that he felt compelled to do what he could to help rescue Haruna Yukawa, 42, after he was abducted in August near the city of Aleppo. Yukawa had been through a number of difficult life situations, including bankruptcy, his wife’s cancer diagnosis and a suicide attempt, and thought that perhaps becoming a military contractor would change his life for the better. After learning that Yukawa had been captured by Islamic insurgents, Goto left Japan in October and eventually made his way into the ISIS-seized city of Raqqa. The seasoned journalist said that he believed he wasn’t as high risk as those from other countries. But just before the end of the month, days before he planned to return back home, Goto went missing. 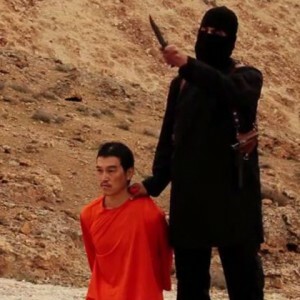 He hadn’t been seen until last week when he was shown in a video with Yukawa and a member of ISIS, who has been nicknamed by the media as “Jihadi John.” The two were dressed in orange jumpsuits and had their hands either chained or tied behind their backs. ISIS threatened to kill the men if they were not provided with a $200 million ransom, and last Saturday, a second video appeared, which featured Goto holding what is believed to be a photograph of Yukawa’s dead body. He advised that ISIS had said it would free him in exchange for would-be female suicide bomber Sajida al-Rishawi. Earlier this week, Goto was featured in a second video, holding a photograph of Jordanian pilot Moaz al-Kassasbeh, and warning that ISIS would kill both of them if al-Rishawi was not released. On Thursday, Goto’s wife issued an emotional plea on behalf of her husband. But on Saturday, a video was released online entitled “A Message to the Japanese Government” that showed the purported beheading of Goto, generating outrage worldwide. “Japan will work with the international community to bring those responsible for this crime to justice,” Prime Minister Shinzo Abe vowed. An “I am Kenji” social media effort quickly emerged as well in a show of support for the reporter.